Click Here to view office photos! When you visit our dental offices, your smile is our top priority. Our entire team is dedicated to providing you with the personalized, gentle care that you deserve. At Glenview Dental Associates and Bode Dental Clinic you will experience all that modern dentistry has to offer, including a comprehensive list of general, restorative and cosmetic dental care services to meet the needs of the whole family. Our goal is to assist each patient in achieving and maintaining long term dental health and a beautiful smile. We believe that excellent care means a total commitment to the 100% satisfaction of every patient. Part of our commitment to serving our patients includes providing information that helps them to make more informed decisions about their oral health needs. This website is a resource we hope you’ll find both useful and interesting. Dentistry for the Quality and Artistically Conscious! Call Today at Glenview (847) 904-1468 or at Bode (847) 305-2079 or Request An Appointment Online! 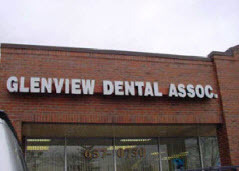 Glenview Dental Associates is a Glenview Dentist providing family dentistry including exams, teeth whitening, invisalign, crowns, veneers and more to patients in Schaumburg & Glenview, Illinois.